THE FAITH OF JAIRUS AND THE WOMAN WITH HEMORRHAGE. 13TH Sunday of Ordinary Time (B). This Sunday’s Gospel presents to us two wonderful miracles performed by Our Lord: the resurrection of Jairus’ daughter and the healing of the woman sick with hemorrhage for 12 years. On the other hand, Our Lord was impressed by the determined exteriorized manifestation of faith of Jairus and the sick woman on God’s omnipotence. 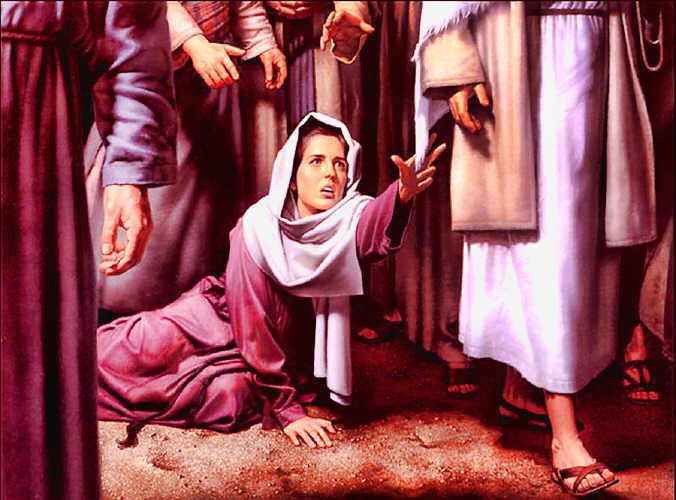 In Jairus’ case, Jesus seeing him fall at his feet…”went with Him”. 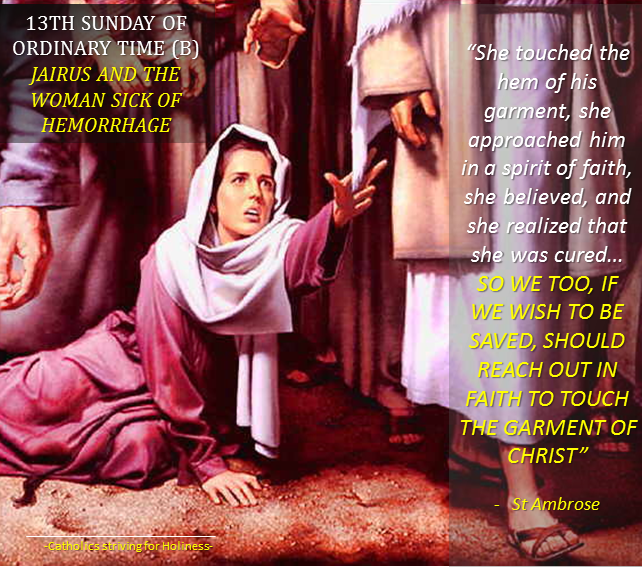 We have a lot to learn from the examples of Jairus and the woman sick of hemorrhage for 12 years. Both cases, considered from a human viewpoint, can be considered hopeless cases, after having put all the possible human means. But Jesus performed these miracles moved by their FIRM FAITH to demonstrate His Divinity, as in all other miracles in the Gospel. ONLY GOD CAN PERFORM THEM BUT BEFORE DOING SO, HE ASKS FROM US A FIRM DEMONSTRATION OF FAITH. Let us not forget though that GOD NORMALLY WORKS IN AN ORDINARY and UNSPECTACULAR WAY and as Christians, we should believe that God is always ready to help us to surmount the difficulties and obstacles we face in our path towards holiness. He also wants us TO EMPLOY ALL THE HUMAN AND SUPERNATURAL MEANS WITHIN OUR REACH. Nevertheless, if God sees it convenient or even necessary, He will always be disposed to work miracles, directly or indirectly (through the prayer and intercession of His instruments, i.e., His saints and the prayer of other people). AND THEN, THERE WILL BE A RENEWAL OF THE WONDERS WE READ OF IN THE GOSPEL. ECCE NON EST ABBREVIATA MANUS DOMINI, GOD’S ARM, HIS POWER, HAS NOT GROWN WEAKER! (St Ambrose, Expositio Evangelii sec. Lucam, VI, 56. 58). ALL THESE ARE SMALL DETAILS, BUT LET US NOT FORGET THAT, THE SAME AS IN HUMAN DEALINGS, OUR LOVE FOR GOD, LIKEWISE, CONSISTS IN SMALL DETAILS SHOWN WITH AFFECTION. Dear friends, let us ask the Blessed Trinity to grant us A FIRM, UNDOUBTING FAITH IN HIS OMNIPOTENCE ─All-Powerful!─ without forgetting that He normally works in an ordinary and hidden manner and expects from us as well to put both the human and supernatural means. Moreoever, may WE ALSO LEARN TO PRAY WITH OUR BODILY GESTURES WHICH are NOT ACTIONS DEVOID OF SPIRITUAL SIGNIFICANCE, BUT RATHER THE OPPOSITE: they should be done as external manifestations of our faith and putting our mind, heart and body. Let us not forget as well that WE HAVE SOMETHING MORE THAN THE GARMENT OF CHRIST: OUR LORD’S REAL PRESENCE IN THE EUCHARIST! Not only can we touch Him, but receive Him as well in our body and soul in grace….God in our body and soul! And Jesus longs for us, for our presence, for our details of love and affection, our frequent dealing and contact through prayer, sacraments… LOVE IS INVENTIVE! Are we willing to show our faith, love and affection for Our Lord in small details and through concrete deeds daily? Take care and God bless you and your loved ones!